‘Perperos,’ indoctos, stultos, rudis, insulsos, mendaces. Accius Pragmaticis—describere in theatro perperos popularis. ductabilitate animi nimia vestra aut perperitudine. 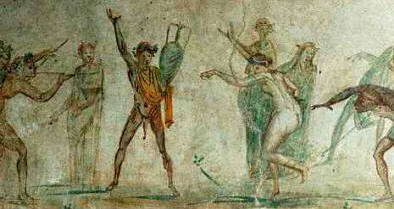 “The Sicinnium was once a type of ancient dance. The poet Lucius Accius once used this term in his Principles and says that they were called “satyr-shakers of nebulous name”. I think he uses the word “nebulous because it was uncertain why anyone said “sicinnium”. credo propterea nebuloso quod sicinnium cur diceretur obscurum esset.